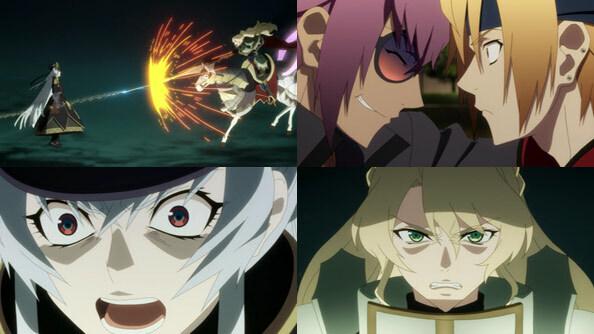 With Altair, well, not defeated per say, but ceasing to be a threat to the world last week, Re:Creators can relax and do a leisurely victory lap. 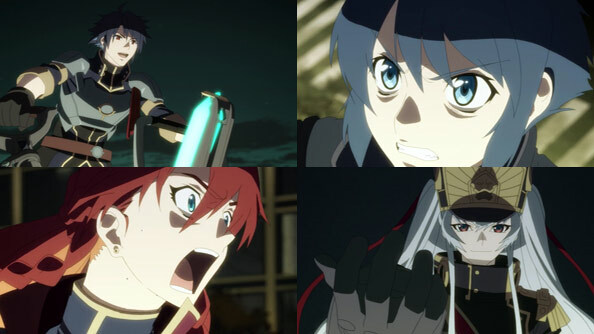 The five creators remaining on the battlefield accept their supporting roles in a story that ended up being primarily about Altair and Setsuna. The other creators congratulate Souta for his achievement, even if, especially for Matsubara and Takarada, it hurts that their heroines had to die in order to win. But Meteora steps in to assure Matsubara that only one possible Selesia’s story ended there; there are countless others that remain alive, and more still as long as he’s committed to keep adding to her world…coffee, for instance. After a celebratory feast at a down-home restaurant, Meteora also points out to the other creations that they will all have to return to their respective worlds soon, as her magic will eventually cease to work as the world restores its proper order (an order in which her magic doesn’t exist). 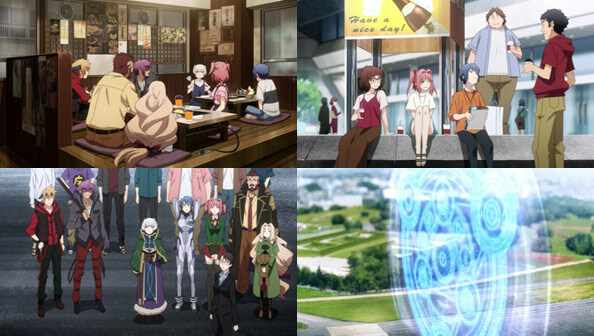 After the creations and their creators spend one last day together, saying what they want to say and suggesting what they want to suggest, Meteora opens a return gate. One by one, the Creations say their final goodbyes and walk through the gate, disappearing from the world in physical form but not in the hearts and minds of their creators and fans. I was kinda wondering where Magane was in all of this, and I really wish we’d been able to see more of her…did she de-coalesce off-camera after using her ability to help Souta? In any case, Meteora has one more plot twist in store: she’s staying. I mean, even if she wanted to go back, she can’t go through a gate she is keeping open any more than she can pick up and throw herself. But she loves this world, and has always seemed quite comfortable here. So while she loses the rest of her magic as soon as the gate closes, I have no doubt someone as strong and brilliant and charming as she will land on her feet. 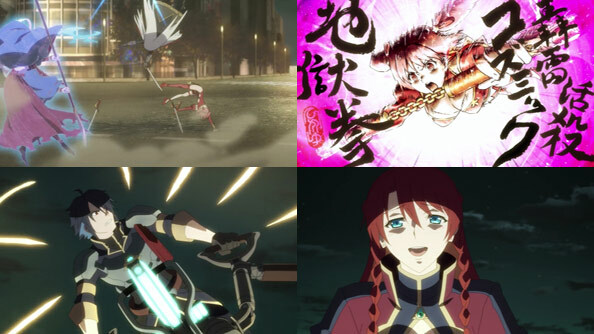 A bit of time passes, marked by the emergence of several new advertisements around the city promoting new seasons of the creators’ creations, each with new stories that reflect their experiences during the Chamber Festival: Shou and Yuuya fighting side by side, Blitz with his daughter by his; Hikayu’s new martial-arts master alter-ego; Magical Slayer Mamika meeting Aliceteria. Everyone continues to create. Whatever problems people had with the story of the Chamber Festival (and it did kinda go all over the place, if we’re honest), creators can’t look up to a standard they worry they’ll never approach; they can only keep moving forward, and keep creating. That’s the surest way to achieving happiness not just for themselves and those who consume their work, but for their creations too. 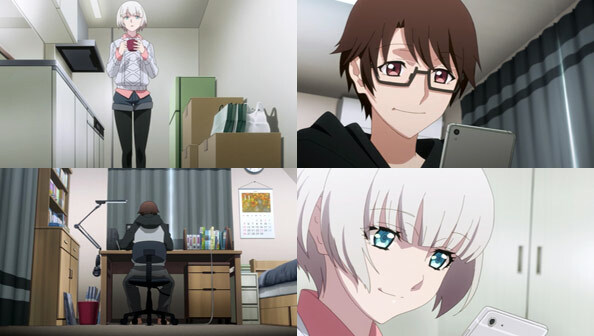 I’m also heartened to see Souta and Meteora exchanging texts in much the same way Souta used to do with Setsuna, only now he’s a little older, a lot wiser, and more importantly, confident enough in his ability as a creator in his own right, to be anything but proud and supportive of his friend’s efforts. Meteora has pivoted to creation herself, and has decided to name her first work Re:CREATORS—the very work we just spent 22-plus weeks watching. 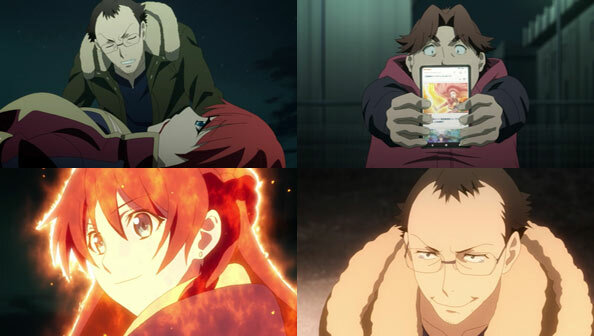 Thanks to Magane, Souta was able to create a miracle in bringing Shimazaki Setsuna back to reunite with her creation Altair. But early in the reunion, I was filled with a constant uneasiness—and was no doubt meant to be—would the all powerful Altair truly accept this? If not, how long would it take before the spell was broken, she breaks the train station world, and returns to the real world. What the heck will Team Meteora do then? Everything is on the line here. Well fortunately, there are no further twists or turns or defeats for Souta and the team; this really is it, and as soon as Setsuna speaks, Altair is well and truly neutralized as a mustache-twirling, world-ending villain. She becomes something far more complicated and interesting; something she only could have become by meeting her creator. Setsuna doesn’t transparently beg Altair not to destroy the world. Instead, she starts by apologizing for making Altair carry the burden of “curses” she carried with her until death and transferred to Altair. Without judging her, Setsuna earnestly thanks Altair for her efforts, even if they were ultimately misguided. Setsuna also impresses upon Altair the fact that she is no longer simply her creation; she’s become accepted and loved by everyone as a “king” or “knight of the weak” who took her weaknesses and made them strengths. Altair will always have power, and never be alone, as long as those others exist. So, realizing her presence is a miracle, but a “twisted” one that shouldn’t be (at least in her world), when the train alarm sounds, she walks to the same spot where she walked before and leaps out over the tracks. 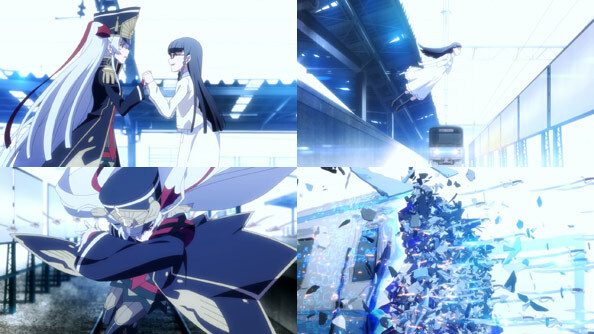 Only this time, because she’s not alone, Altair rushes in front of the train and destroys it with her Holopiscon. 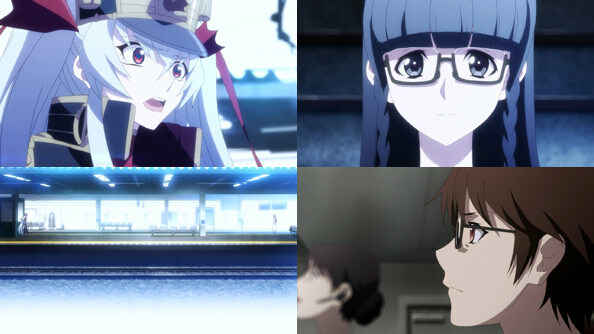 When she finds no matter how much she hacks at it, the train will still come in a fraction of a second, Altair redirects the infinite power Setsuna and the world has bestowed on her, into creating Setsuna’s story from now on. That means creating a world where she and Setsuna can live—them, and no one else, it would seem. Altair is no longer interested in destroying worlds, only creating one world where she and Setsuna can be together, and where her story can continue. They’re basically gods now. There, in the water, Altair finds a pair of glasses, but they’re not Setsuna’s—they’re Souta’s. Setsuna recognizes them as such, and without saying his name, tells Altair that she was drawn in the first place because of Souta, and others who liked her creations and wanted to see more. Whether the Setsuna we saw was a combination of who she really was and Souta’s own interpretation of who she was, or one or the other, Souta poured his own heart and soul into creating her, which makes her basically the opposite of Sirius. 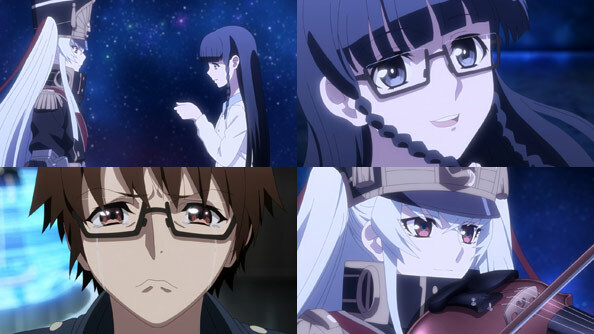 All Souta wanted was to “see the same world” as Setsuna. And he did, thanks not just to his own efforts, but to those of the other Creators, their Creations, and the people whose acceptance made them endure. With one more strum of her Holopiscon, Altair and Setsuna are transported away to their own little infinite world, leaving the normal world safe and bringing a happy (if somewhat bittersweet) ending to Chamber Festival. The hosts sign off, the stadium roars with approval, and the creators and Meteora stand in the control room, basking in the knowledge they saved their world. 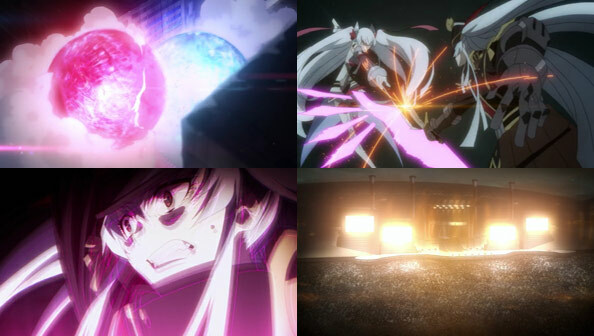 While Altair’s transformation was quite sudden, and doesn’t fully absolve the fact that she was fairly one-dimensional up to this point, the means by which she transformed were credible and even, at times, genuinely affecting, for which a lot of the credit goes to seiyus Toyosaki Aki and Ohashi Ayaka. I also appreciate that the main conflict of the story came to a climax and was resolved with one episode to go, which means there’s time for a closure-giving epilogue. One by one, Team Meteora’s bag of tricks are neutralized or absorbed by Altair, who unlike other creations, never had a backstory or any distinct story at all that she is tied to. Instead, she’s an open source character whose abilities and power are as infinite as the internet. She is, as she says, a product of emotion, not logic, both in her sole motivation (to avenge her creator by destroying the world that rejected her), and the way the vast and ever-expanding network of creators who fuel her existence and acceptance has reached a near-relativistic scale. 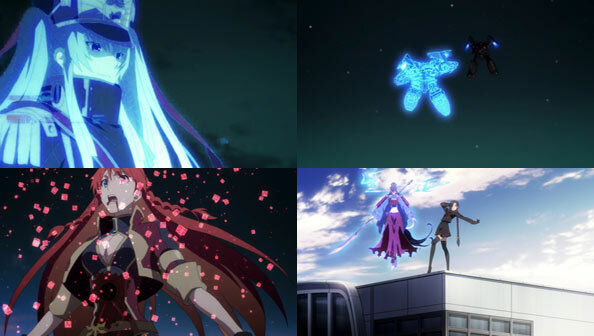 This is why she can take away Hikayu’s new martial arts abilities with one strum of her rifle and even turn the tables on Sirius, her essential copy and the last remnants of Shimazaki Setsuna’s original creations, turning their secret weapon into one of her own to restore herself, complete with new outfit. Throughout their struggles, Meteora and the Creators and Creations on their side have had to abide by certain rules, which means they were never going to be able to defeat an entity that surpasses those rules and can change them or make new ones on the fly. 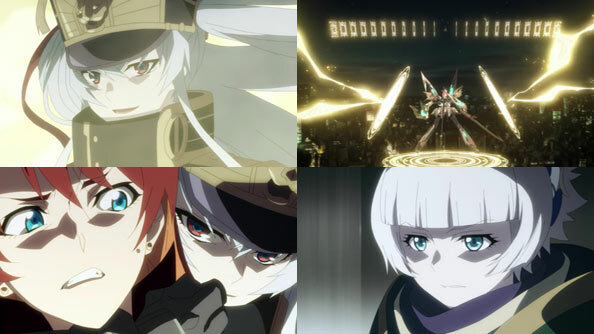 Enter Chikujouin Magane and Mizushino Souta, with the last weapon against Altair, one that, if it’s ineffective like the previous ones, will result in them resigning themselves to the fact the world really will end. 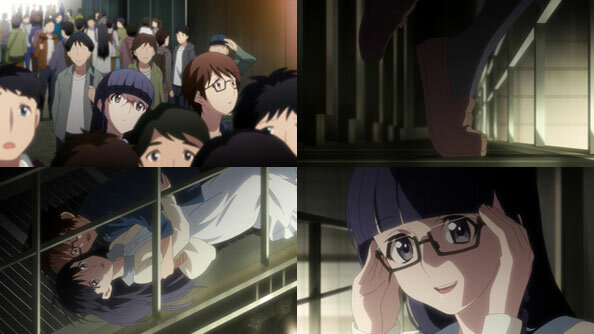 A lie about a lie (in this case, the impossibility of beating Altair) turns inside out, transporting Altair and the others to the day Setsuna took her life, just as she is approaching the train platform from which she intends to jump. This development, prepared mostly in the background by Magane and Souta, totally flips the script, as it messes with cause, effect, and reality in ways nothing else in their arsenal had been able to touch. Will Altair find a way around this as well, her rage further fueled by her foes’ readiness to drag her dead creator ‘out of her grave’? Are hours numbered? Or will she stand down on her own, without having to be destroyed? Never count Altair out, even when she’s imprisoned in a glowing yellow cube, she still has Charon on her side to protect her. This creates all sorts of problems for Team Meteora, as throughout much of the episode Selesia has no idea what she should do, and only ends up mucking things up, including continually getting in Kanoya’s way. Down on the ground, Yuuya manages to get Shou to fight on their side, and Shou notes how the Yuuya in this world is different from the villain in their world. Aliceteria gets her chance against the now-freed Altair, but mistakes Altair’s despair for contempt. Altair is barely a character; she’s merely a force of nature. Destroying the world that destroyed her Creator is less will and more instinct. While this episode gets its usual top marks for style as everyone battles Altair and Charon in their various unique ways, there’s one major problem hanging over it all: I simply do not care about Charon. He’s been introduced to the conflict so late, he’s little more than a plot device. That Altair was able to so easily and completely convince him that her cause was just; that he’s so stubbornly non-receptive to the protests of Selesia—purportedly one of his closest friends; it just doesn’t jibe for me. But as this is the fourth-to-last episode, it’s time for some Creations’ stories to end, and with that in mind Aliceteria’s exit doesn’t come as much of a surprise. Her arc was basically complete; she went over to the right side after overcoming Altair’s manipulations, only for her forthright chivalry to be pissed on by Altair’s glorified parlor tricks, turning the damage of her coups-de-grace on Alice and erasing her from the world. RIP Aliceteria February. Your raw brawn and bluster simply weren’t suitable for this kind of battle. Yuuya, Shou, Tokar, and Hikayu gang up on Altair, but she’s able to counter each and every one of their simultaneous attacks, as her nearly-limitless power is just as accepted by the crowds watching than everyone else. It looks very much like another stalemate, but if they can bring Charon down they can at least take away her final ally and shield, allowing all the remaining Creations to go after Altair at once. Sadly, the remaining Creations are reduced by one more in order to get rid of Charon, and that Creation is Selesia Yupitilia. Finally deciding to fight Charon rather than join him, she lets him stab her Vogelchevalier, she locks him in a bear hug and holds him there for Kanoya to blow them both away, after Selesia has delivered her goodbyes to everyone, including her good friend Meteora, who looks suitably devastated as the Vogelchevaliers explode. R.I.P. Selesia. Good riddance, Charon. With three episodes left, Altair is finally on her own…unless you count the countless fans in the world unknowingly helping her accelerate the destruction of their own world. 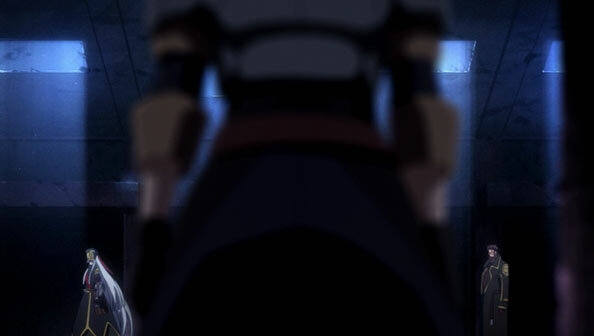 Will the remaining Creations on Team Meteora be able to overcome their grief and summon enough power to defeat her? If anyone can counter her cause-and-effect abilities, it’s Magane…and Magane is rooting for Souta. 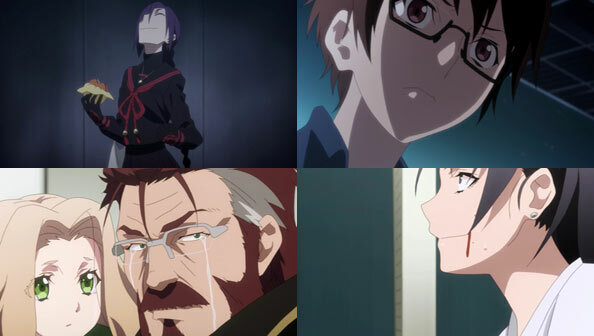 Whatever wasn’t working for me last week as the Chamber Festival kicked off, it mostly worked this week, while the best thing about last week—Suruga’s gutsy confrontation with Blitz and the reunion with her resurrected daughter—was carried to a satisfying climax: Blitz switches sides to protect Erina. The merging together of Blitz and Meteora’s stories was accepted by the audience because, well, who doesn’t like parents reuniting with children thought dead? Also, Suruga was wearing one hell of a bulletproof vest, so she’ll be fine; she didn’t have to sacrifice herself to save the world…yet. Yuuya and Shou go at it, and because Yuuya doesn’t have Hangaku, he’s at a distinct disadvantage…until Extreme Final Legend Martial Artist Hikayu appears, perfectly matched to Yuuya’s skilled set and ready to bring the pain…while retaining Hoshikawa’s easily-embarrassed personality. I’ve loathed Oonishi since he appeared, but have to give him props here. Armed with a dating sim protagonist with no fighting abilities, he converted her into a badass fighting machine, and the audience just rolls with it, because they truly DO like ‘this kind of thing’—that thing being fanservice. What held back last week to some degree was the absence of the most intriguing creation, Magane, who until now has been merely observing. The ‘side’ she ultimately chooses to ‘put her money (or pyrite) on is Souta, and Souta alone, whom she sees as being “just like her” in how the ends justify the means. 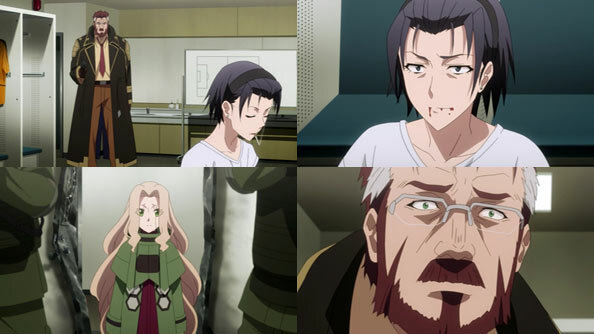 Souta has decided to move beyond selfish regrets, and gotten better at knowing how to talk to Magane, but she still gets him wound up, allowing her to use her Infinite Deception of Words. Fortunately, she uses it to his advantage, promising him his creation will not only be set into motion, but be accepted and stir people’s hearts. I like the move: it feels like something Magane would do to make things as entertaining as possible. She likes fun things, and believes she’ll get to witness a lot more fun if Souta is free to do his thing, so she offers him this indirect help against Altair as an endorsement that however he handles things is okay with her. As Shou, Hikayu and Yuuya bicker over who will fight whom, Blitz arrives, and Shou assumes he’s there to back him up. But Blitz shoots at Shou instead, Hangaku suddenly reappears beside Yuuya (Souta lied about Magane not giving him back), and we have ourselves a three-on-one fight (four-on-two if you count the dolls). 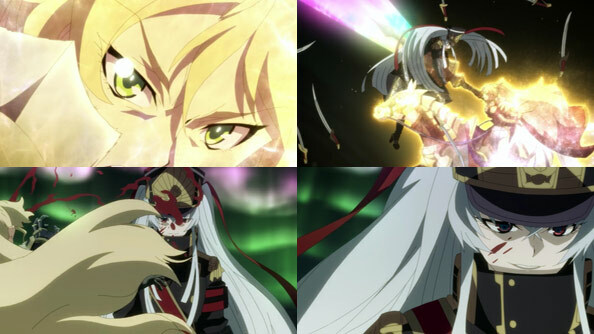 Shou holds his own until Hikayu brings down the hammer with her Killing Cosmo Hell Fist (summoned with a lot of mumbo-jumbo about Arhat and Vajra and accompanied by calligraphy) to put him out of commission. I love how useful Hikayu has suddenly became this week. Even better, Shou doesn’t get back up or try to fight to the death, because Hikayu and Yuuya also manage to convince him of the truth: Yuuya didn’t kill who Shou thought he killed. Yuuya blurts out some spoilers about the mastermind in their story, but somehow the audience—entertained so much by what’s gone down thus far—also roll with that, and the story remains stable. 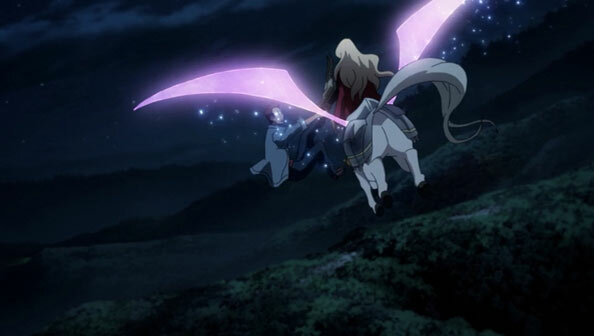 That brings us to what has ended up the least interesting part of the Festival so far: the aerial battle with Altair. Don’t get me wrong; I liked Altair’s spinning array of sabres and her ability to stop a Vogelchevalier’s blade with one hand was badass, as was Alicetaria’s big smile while riding Gigas Machina. But throughout the match there’s the underlying feeling that whatever more powerful thing Selesia, Kanoya, and Aliceteria throw at her (and they finally get her in a cage, separated from her weapons), she’ll be ready with a countermeasue and a smirk, making all the action to that point somewhat pointless. But even that is a a common thing in drawn-out shounen battles, so it’s at least consistent. We’re also well aware that while she’s lost Mamika, Aliceteria, Blitz, and Shou so far, she still has Charon in her back pocket, and Charon seems fully on her side, despite his history with Selesia. Indeed, I am not sure Meteora, Selesia & Co. were even aware of Charon’s existence, rendering him the latest wild card that would muck up their plans to cage Altair. How will Selesia deal with her former ally (and lover?) fighting on the other side? Will they be able to muster some on-the-fly writing that will bring Charon to their side? Four episodes remain…plenty of time for more twists and turns. 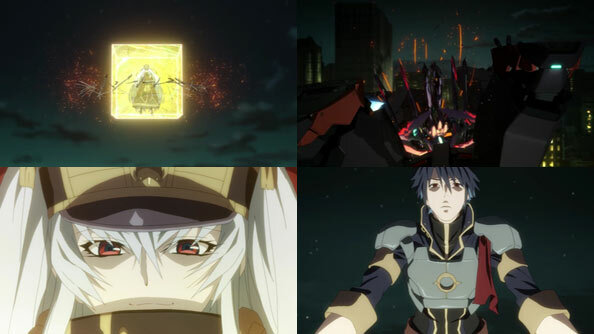 After another week off for another special following a calm-before-the-storm episode, Re:Creators has been giving the impression that it’s not keen on ever ending, even though it must five episodes from now. The supposed “final” Chamber Festival battle has been built up and hyped for so long, its beginning was always going to be hard-pressed to live up to it. In a distinct case of “be careful what you wish for,” this episode finally initiates that beginning, and is almost all action, with physical, magical, and verbal ammunition filling every nook and cranny of the screen. Selesia and Kanoya fight an arrogant-as-ever Altair, who deflects all their attacks with her infinite arrays of sabres. As they dual the boss, Yuuya faces off against his old buddy Hakua Shou, which made me wonder when Selesia’s partner would come out of the woodwork and present her with the unexpected scenario of having to fight him. Even Magane shows up to scare Souta, suggesting all of their best-laid plans are far from certain to end this conflict. Indeed, Altair kinda does what I did with these battles, which is shrug. She seems all too aware of the artiface that has been building around her, and the perfect nature of the military weapons being deployed against her screams Meteora. 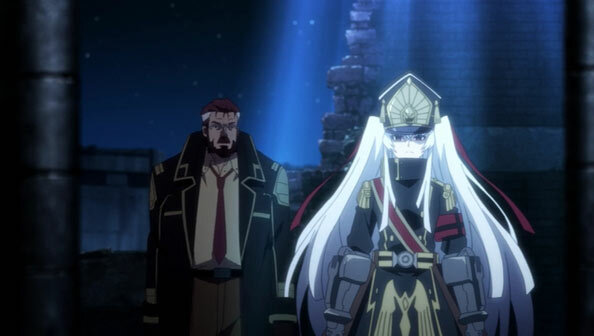 Even when Selesia uses a powerful “infinite gate” imprisonment protocol, Altair simply slips out of it and comes at Selesia from behind, as Magane did with Souta. But if all of this is just foreplay, and Altair isn’t falling to (or for) it…why should we care? Sure, the crowds seem entertained, but to me it feels like various groups of combatants sniping at one another with increasingly insipid slogans, Altair being the most guilty of this. For all the evidence this battle has begun, there’s still the feeling that some stalling going on. For a moment, I thought Suruga was not only expecting Blitz, but okay with him killing her. Hearing her talk about the pain and sleepless nights and despair she endured before she gained success isn’t quite enough to make Blitz stand down, but Suruga’s status as his creator is, as a strike team blasts into the room, accompanied by…Blitz’s very not-dead daughter, Erina. Has Team Meteora poached another ally from Altair? 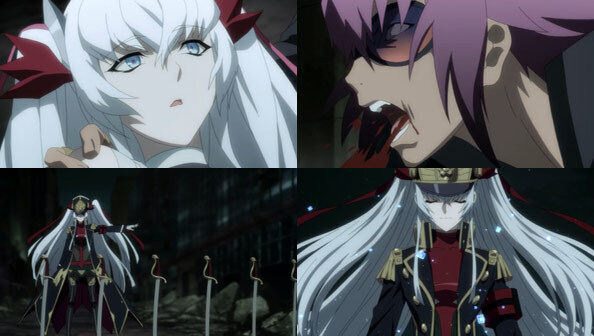 Those hoping for Re:CREATORS to deliver an action-packed episode after a two-week wait will be disappointed, unless their idea of action is more than half of the episode being spent lounging around a hot springs inn. The reason everyone is at the retreat is to recharge and celebrate all their hard work, and is itself cause for celebration: it means that the Elimination Chamber Festival is finally, finally going to get started. While there’s not a lot to note in the inn scenes, there are some nice character interactions between creators and creations alike, with particular focus on how the more time creations have spent in the human world, the more they come to appreciate it, as well as mundane things like the smell of the hot springs. Also, Kikuchihara is a stern drunk. 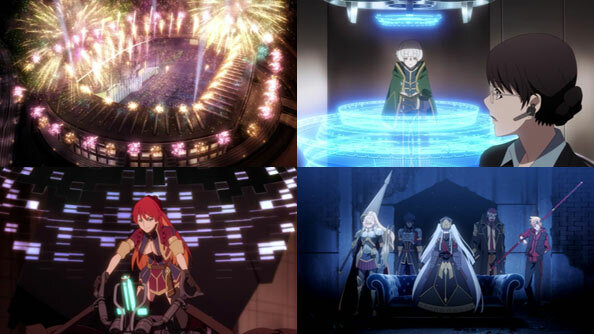 At last, Nissan Stadium is filled up, Meteora and her comrades are powered up, and the grand premiere party of ECF is kicked off by animated versiosn Selesia and Rui’s real-life seiyus, Komatsu Mika and Amamiya Sora; a nice meta moment. The team prepares and baits the birdcage, and Selesia is finally reunited with her Vogelchevalier (which I’m sure she prefers to a government-owned Toyota 86, as nice as that car is), and we cut to Altair and her crew, clearly ready to dive in. Of course even promising, exciting build-up is just that: build-up. The pieces are in place, but we’ll have to wait yet another week to see how it all shakes out. I would be very surprised—and even disappointed—if everything goes according to the good guys’ plan. Hoshikawa Hikayu is the newest member of Team Meteora, but as she’s the heroine in a dating sim, nobody’s sure what use she’ll be quite yet, and in the meantime she’s very disoriented with everyone knowing who she is. After a rare in-show flashback in which Blitz tries in vain to save his daughter Erina, he meets Hakua Shou, who is an enemy of Mirokuji Yuuya, since Yuuya killed a friend and a sister of his. Off on her own, on no one’s side but her own, is Magane, living it up half-naked in a luxurious penthouse, bathing in cash and drinking milk by the quart. Watching horrific news stories on TV makes her giddy for the possibilities for mischief this world so readily presents to her. She’s even more intrigued when Aliceteria shows up, asking her to “make things really fun”, as the knight is now willing to make a deal with the devil in order to stop Altair. 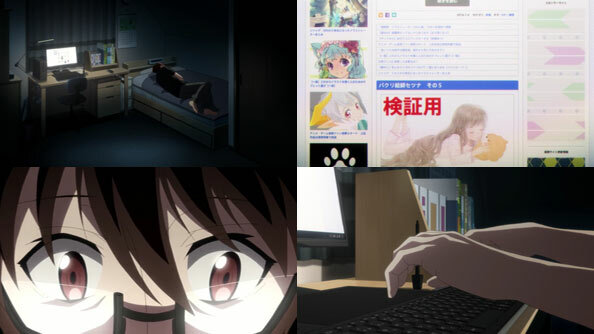 As Meteora develops a spell, based on newly-created material, that allows her to gauge public acceptance of the new character and story changes, Hikayu’s creator Ohnishi appears, and he’s a total creep and a pervert who initially doesn’t understand that Hikayu (and Celestia, and Meteora) are people and not playthings. Speaking of fans, Altair knows she has many, and they imbue her with new powers by the day, so many she doesn’t even know about some of them herself. Yet to Blitz, she still remains a character almost designed to be weak, like a kingdom created just to be destroyed. He couldn’t save his daughter, but he’s committed to saving her. We’ve met some new people, checked in on all the existing people, and gained a few new insights into the coming battle, but the battle remains “months” away by Altair’s reckoning. 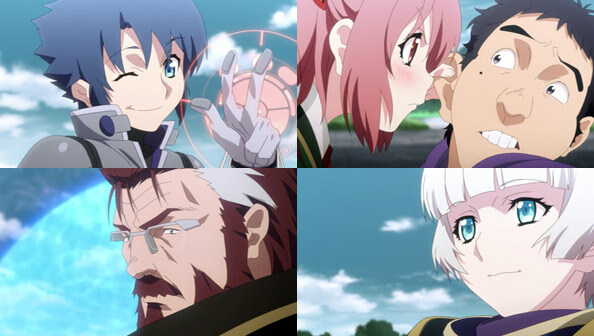 It’s fitting Meteora brought up structure, because it will be interesting to see whether Re:Creators continues with the structure of this episode—shifting from one pair or group of people in a room talking to another—for the next seven episodes, or if, say, Magane makes things a little more fun. 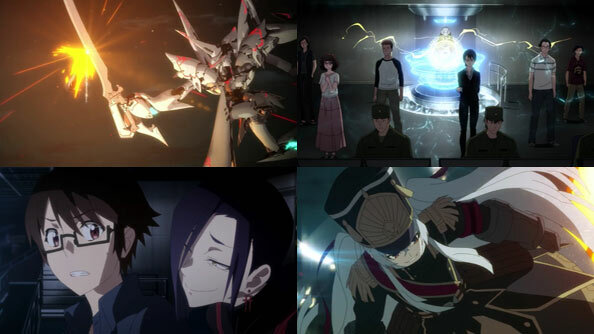 With the nature of the operation to bring down Altair in place, Kikuchihara brings in dozens of creators to brief them on how things are going to work. 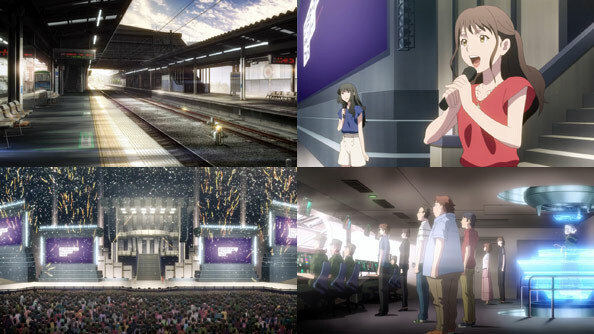 The anime that will unite all of the Creations’ worlds and stories will be called Border World Coliseum, and it will be unveiled at the “Elimination Chamber Festival” at Nissan Stadium. 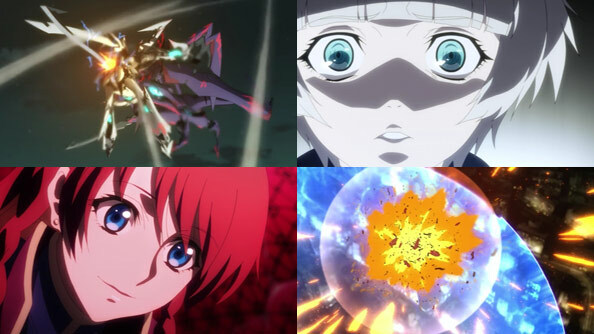 The goal is not to make the best anime ever, but to create an anime—and source material and spin-offs of the existing anime—that the public will “accept”, as in, win their approval and fandom. Only then do they have a chance against Altair, who has no one, set, official Creator. As such, the Creators are the ones who take center stage, with the Creations in the background searching for the new arrival. It’s a hit-and-miss affair; watching a limp battle between a bunch of thinly-drawn characters’ personalities in a nondescript room doesn’t exactly set the heart aflame. However, it does demonstrate the problems that arise from sudden unexpected alliances in the industry, combined with a need to collaborate with one another despite wildly-different styles, all with tight deadlines many Creators are used to blowing by without consequence. 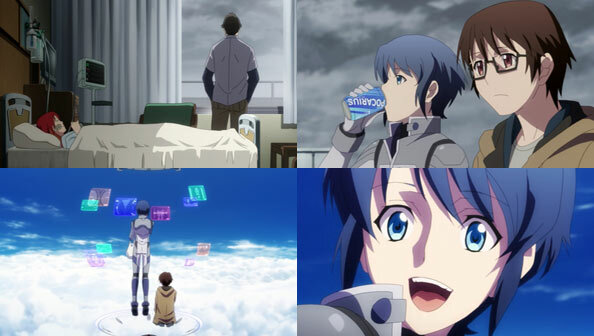 When Suruga draws an awesome drawing really fast right in front of Marine, who takes longer to produce art and doesn’t have a lot of confidence, Marine storms out to have a little cry. When Souta goes out to reassure her, he tells him there’s nothing he can say to convince her she’s not “bad”; all she can do is the best she can and hope this whole thing works out. 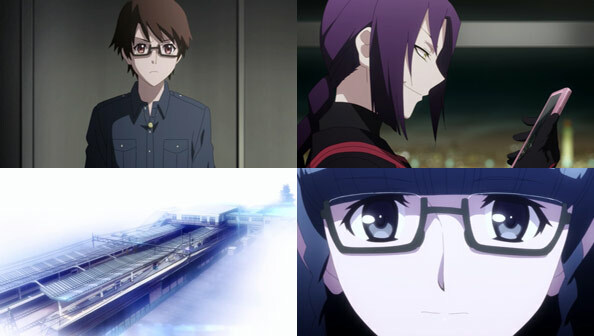 The grind of doing so can be painful and make her feel useless, but as the episode title continues, “it’s fun nevertheless.” That gets (the very useless-feeling) Souta thinking: maybe he should contribute something creatively to the operation. We don’t hear any specifics of his idea, but Matsubara and Suruga seem to think he indeed has an important contribution to make. As for the newcomer, or rather newcomers (there were two such phenomena detected, suggesting two of them), the first appears before Selesia and Kanoya while they’re simply walking around town. 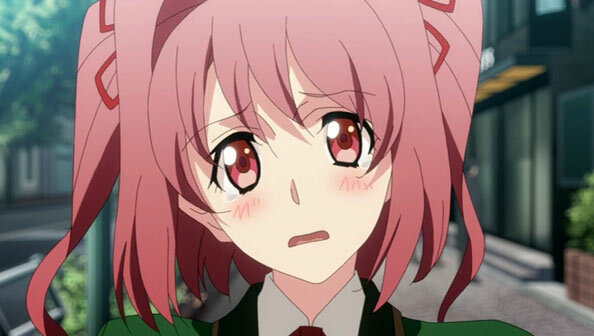 She’s a high school student in a green uniform with rose-colored hair—an echo of Mamika’s pink. The new OP (with a nice new theme) suggests she’s from a Romance while the new ED suggests she’ll be on Team Beat Altair. Either way, there’s nothing like a couple of new players appearing on the board to freshen up the game. 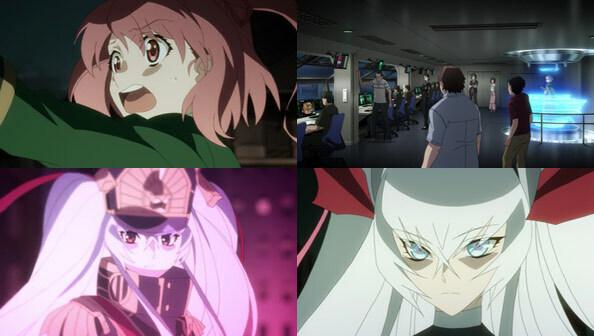 One thing on which Oigakkosan and I can agree is that one of the best scenes of Re:Creators to date comes at the end of the very first episode: a smash cut from the serious end credits to the newly-arrived Meteora and Celestia going on a convenience store snack spree on Souta’s dime. It’s a successful scene for so many reasons, among them that it establishes the clever fish-out-of-water dynamic that was later largely abandoned once the battle with Altair began in earnest. 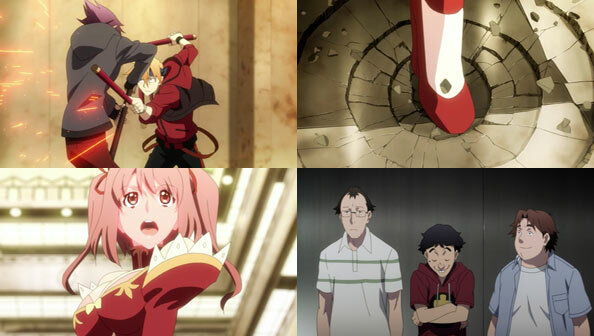 It was also a strong indication that the creators of Re:Creators had a sense of humor, and unlike some Troyca shows, wouldn’t mind cutting loose and having a little fun from time to time. Aside from some in-show commentary from Chikujouin Magane, Re:C hasn’t done as much as either Oigakkosan or I wanted with the potential established in that first episode’s final scene. Heck, they even killed off my favorite Creation at the time (Mamika), the one with the most ridiculous attacks and sound effects. Fortunately, and quite to my surprise, that cheeky, mildly self-deprecating tack returns with a vengeance in this, the ostensible recap. 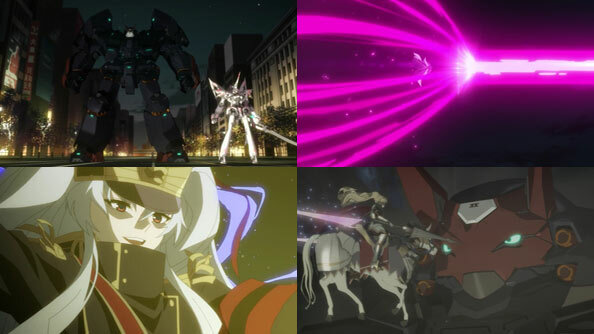 It turns out to be more of an Osterreich recap, as Meteora delivers a fun and amusing fourth-wall breaking commentary, even embellishing her own importance and appearance in the story. 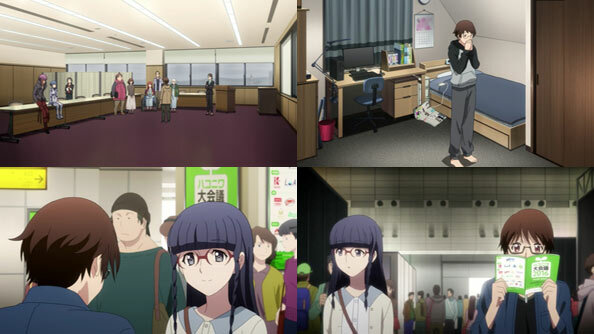 Where her potential had been somewhat dulled by being trapped in the show, with Meteora free to discuss things like the synopses of the various characters’ anime (often lifting it verbatim from the official websites), she morphs into a neat audience surrogate, and share her opinions on how things have gone thus far the normal format of the show wouldn’t allow. The show’s willingness to pull Meteora, the talkiest of the talky creations, out of the world of the show and into ours matches the premise of the show, and reestablishes that first episode potential by making sure my smile rarely leaves my face throughout her recap. 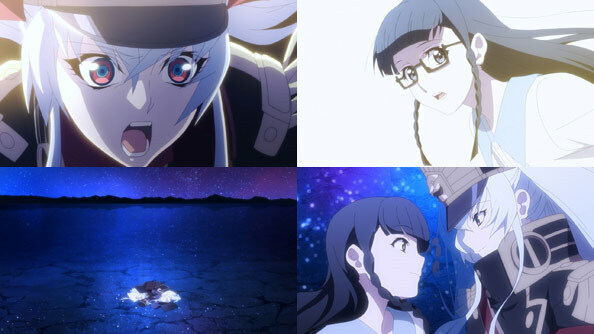 Initially portraying herself as far “sexier” than she really is; taking great pains to explain why Celestia lost her first battle against Mamika so badly; criticizing Yuuya and Alice (AKA Grasshopper Glasses and Muscle Brains) for so easily falling for Magane’s deceptions; it’s all great stuff. 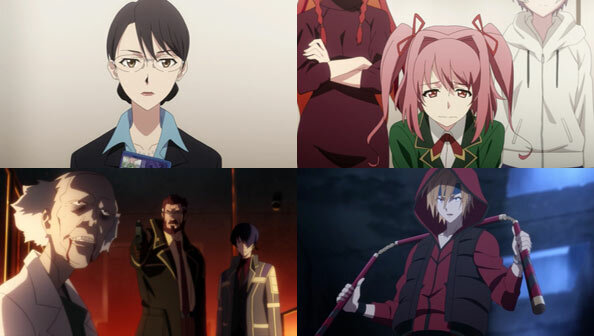 At the same time, we’re getting little glimpses and tidbits of their stories before they became a part of Re:Creators. After appearing again as a statuesque, scantily-clad pool hustler (with the other characters represented as balls), Meteora saves her most biting verbal venom for the show’s villain, Altair, tearing her character design apart as needlessly, annoyingly complicated, and suggesting that the producers change her outfit to a tracksuit and sandals (which we unfortunately never see, but which I’m sure a fan will draw at some point). Badly karaoke-ing “World Etude” was also a nice touch. 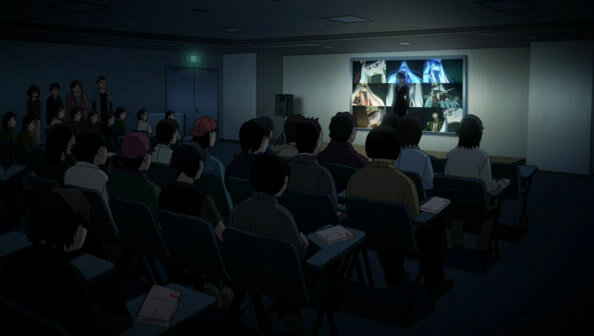 In the final scene, we’re back in the conference room from the previous episode with all the characters assembled, everyone but (regular-looking) Meteora frozen in time while she walks around with a spotlight above her. 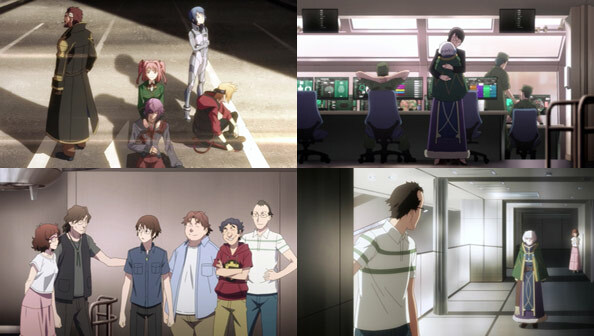 Here, before returning us to the “normal format” and those final moments of the last episode in preparation for the show’s second half, Meteora aims to assure those who are concerned about the future of Re:Creators that, far from a sign of diminishing quality and an “industry in crisis”, this recap was always meant to be. As a recap, it succeeds in going over the various players, where the sides stand, and what’s at stake. 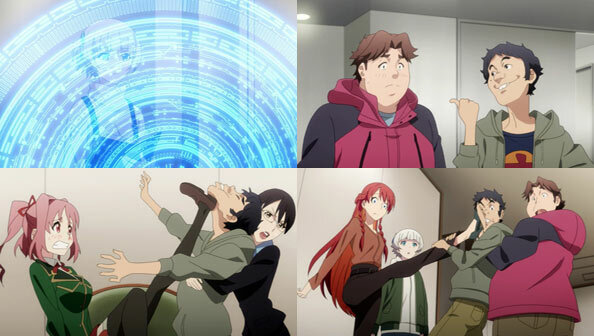 But what makes it a far better recap than I could have imagined—and a more effective episode than some of the normal format ones that preceded it—is its willingness to let its hair down and have some fun with its admittedly cool premise. In doing so it demonstrated bolder, more creative thinking, and gave me fresh hope the show will find its second wind. One thing’s for sure: I’ll never watch Meteora—or listen to her many measured words—the same way again. 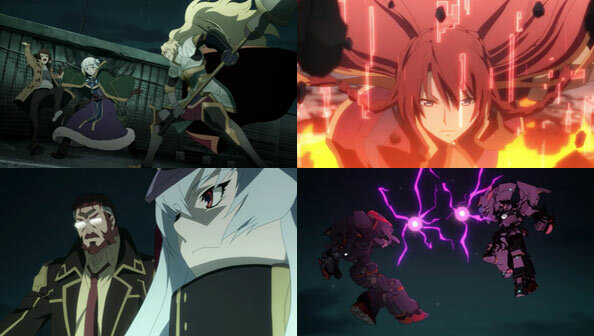 For an episode that purports to have new urgency by doing without the usual OP, this was a jet-cooling return to the less-than-stellar form of some of Re:Creators’s earlier episodes, in which far more is told than seen, things we already basically known are repeated to us so the characters can catch up (almost never a good look), and stakes and details are painstakingly set for a pivotal battle…later. First off, Souta completes his confession, which was a little puzzling to me, because we, the audience, learned nothing new about what happened to Shimazaki, unlike last week. We knew he chose not to do anything to help her, and that eventually led to her offing herself, and that he ran away and tried to forget about her. There’s at least a little bit that’s new as we get more interactions between Alice and her creator, whom she’s even more disappointed in after watching Selestia’s creator demonstrate his love for his creation by quickly revising her in the battle. She wants the same thing for herself, so she can save the world, but her creator says it’s up to her. As he dangles from her flying horse high over the forest, she gets him to admit an embarrassing truth: he actually does love his creation, doesn’t want it to be cancelled, and believes it’s a world that’s worth Febby sacrificing her blood to protect. She releases him and tells him to draw what he wants for the time being. The bond they’ve forged may make it difficult for him to join the other creators, so perhaps she succeeded in taking a potential weapon against Altair off the board. Speaking of that weapon, the static group in the boring beige conference room has a nice long chat about Altair’s power and myriad, constantly-multiplying special powers, thanks to fandom. Clearly many a consumer felt a connection to Altair’s aesthetic and background, and she’s all too happy to draw power from people living in the very world she intends to overturn. There’s great discussion of some clever concepts, including using the resources and reach of the (dubiously reliable) government to build up their own levels and abilities, as well as construct a kind of “birdcage” in the story world with which to capture Altair. To maximize their power and have any chance against her, they have to create a gripping narrative that will capture and, more importantly, hold the interest and stir passion in their audience. They have to save the world with a story. Altair may be singleminded but she’s no fool, and wouldn’t be surprised to learn that there’s a plot afoot to stop her using the same means from which she draws power. But she’s confident she still has the upper hand in the situation (no doubt fueled by the deep-seated despair that brought her into existance in the first place). She also has a new member of the team to replace the KO’d Mamika: Celestia’s partner, whom I highly doubt Celestia will want to fight. With his arrival, and the popping up of two or three more creations she hopes to get to first, Altair likes her odds in the battle that’s coming. Meteroa and Celestia quickly recover from the injuries sustained in last week’s battle. Matsubara is by Celestia’s bedside when she thanks him for the drawing and story that ultimately induced Altair’s retreat. Matsubara believes the people who deserve more of the credit are the masses who saw and liked the art. He also clarifies that he wrote her story as proof he lived, not simply for fun. 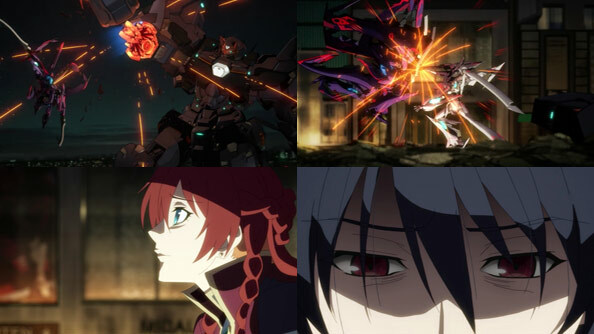 While taking Souta on a head-clearing, exhilarating ride in the Gigas Machina, Kanoya talks about how differently the creations all seem to approach their reason for being, but notes they’re all the same in that all they can do is what they’re meant to do: save the world, in the case of heroes (and threaten it in the case of the villains). Creations like him who save the world only exist because worlds that have to be saved exist. Kanoya recognizes and respects Souta and the other creators’ role as the makers of those worlds, whether as proof they existed, or any number of different motivations creations simply don’t have access to. 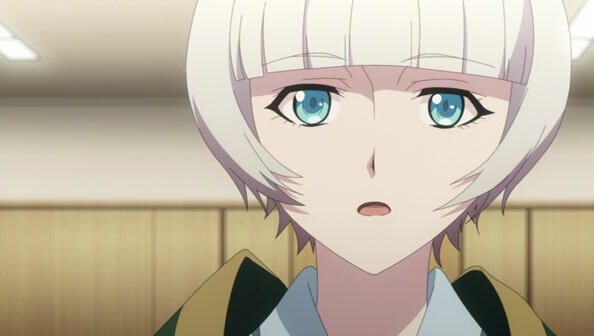 Kanoya gives Souta a lot to think about, and at the first meeting with Meteora back on her feet, discussing how a change in strategy is necessary, Souta provides the reason why: Altair’s creator is already dead, and he killed her. From there, we travel back to Souta’s first contact with Shimazaki Setsuna, when she praised his drawing of Celestia. He liked her drawings, and she liked his, so they started an online friendship that eventually led to an in-person meetup. When they meet at the station, we learn Shimazaki’s real name isn’t Setsuna, but Yuna, that Souta is exactly how she had hoped he would be. Yuna is also kind, beautiful, and adorable, in a way that makes watching her and Souta enjoy the day together, while knowing her ultimate fate, that much more heartbreaking. 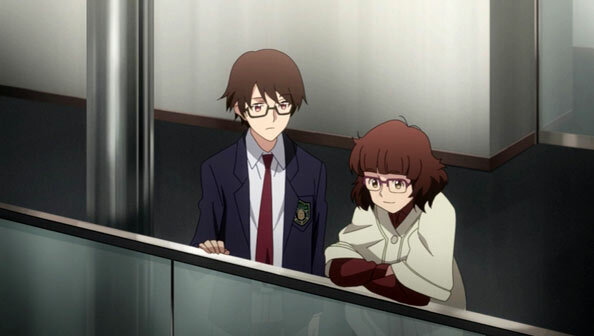 Their day is suddenly infused with danger and dread but also intimacy when they arrive late to a presentation and Souta decides they should go up to a catwalk for a better view. Yuna slips and almost falls to her death, but Souta grabs her (thankfully well-made) purse strap and saves her. The two are suddenly in each other’s arms, heavily breathing, and Yuna is excited by how much of an adventure the day has become. 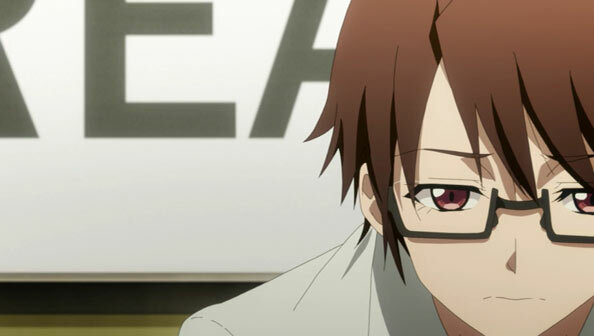 Souta then lends her his glasses, which she takes without hesitation and asks how she looks. We know that despite the sweet start to their relationship, things gradually turn bitter, and while we had the broad strokes of how and why Shimazaki ultimately offed herself, it’s instructive to get the heartbreaking details. Souta, who is, after all, only human and just a kid, gave in to envy and resentment as Shimazaki’s popularity on their art boards took off while he stagnated. Souta found he couldn’t be the supportive voice Shimazaki wanted and needed, and he drifted further and further away. His supportive voice would’ve been of great help to Shimazaki with enduring the storm of hate that hit the boards when another poster—possibly also jealous of her—started the rumor of her plagiarizing work. From there, the mob was off to the races, viciously attacking her and suggesting she kill herself. Throughout all this, Souta was merely an observer. While he initially felt he had to step in and try to help Shimazaki, he felt paralyzed by a number of things: the possibility of the mob turning on him, as well as the slight satisfaction he can’t deny he got from some of the criticism. So while Souta didn’t plunge a sword in Yuna’s chest, he did nothing to stop others from doing so. It was a choice he made; the kind of choice Kanoya said creations don’t have; and it was the wrong choice. Now the world is a place where Yuna is dead, her creation is loose and on a quest of vengeance. But his choice to come clean with the others wasa good one; hopefully the first of several he and the others will make and bring an end to Altair’s tempest. 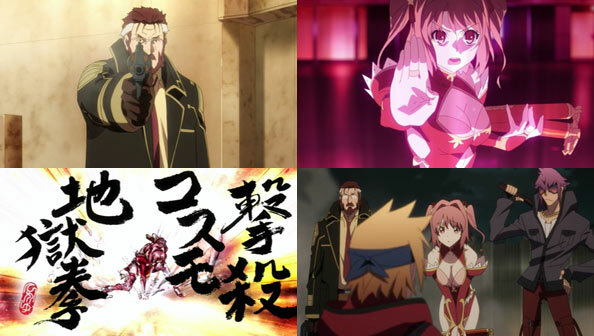 Believing Chikujouin’s lies about Meteora being Mamika’s murder, Aliceteria goes all out against the sorceress, who borrows several missiles but can’t connect on any of them. 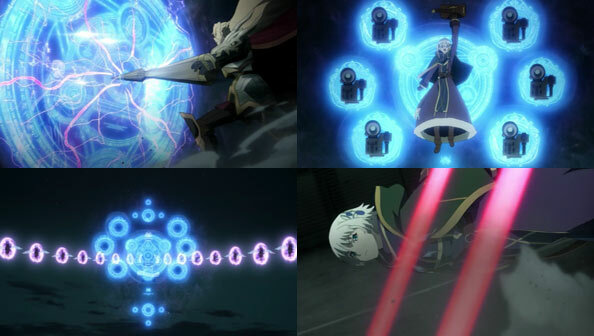 Alice also counters Meteora’s summoned weapons with sommoned warriors of her own, who surround Meteora menacingly and try to catch her in a tangle of red laser beams. 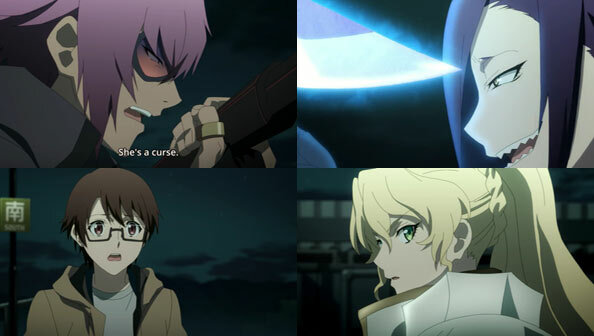 Souta calls Kikuchihara, but she and help may not arrive in time, so it’s up to him to try to stop Alice, and he actually gets her to at least pause by coming between her and a wounded Meteora. He tells her that far from being entertained by the horrors in her world, he’s always felt sad about them, has rooted for her to win a better future for that world, and looks up to her as a lofty role model: a paragon of chivalry, courage and honor. 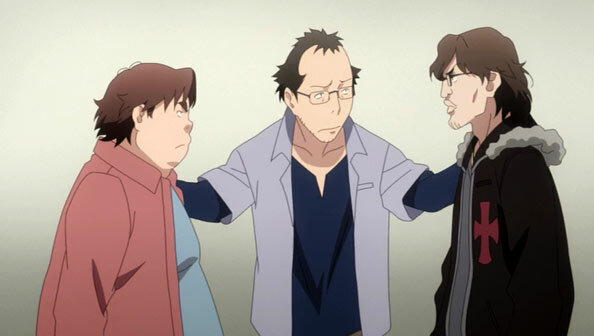 I appreciated Souta finally putting his life on the line for his friend rather than staying on the sideline, even if he’s only armed with words. Like so many creations now in Souta’s world, Alice doesn’t feel like the heroine Souta describes. She’s something different, and someone she believes doesn’t deserve his esteem. But however flawed and fallen a person she has become, she takes stock in the fact she’s still a knight, and will still avenge her friend’s death, come hell or high water. While this is taking place, Mirokuji is fighting Chikujouin, who considers their sparring a form of flirtation, and gets him to agree to hand over his female samurai Hangaku (whom he calls a “curse”) if she beats him. Once Alice has had enough even of the innocent Souta’s talk, she lunges at him, but this time it’s Meteora who gets in the way, taking the full force of her strike. It’s the only one Alice gets, however, before the timely arrival of Celestia. She’s to neutralize Alice, and Kanoya Rui is floating above it all in his Giga as a last-resort. Just when we thought Rui was going to have to be the difference in this battle, Altair appears and attacks him with a clone of his own Giga, thus neutralizing him. Blitz takes his place by Altair’s side, and suddenly all the (living) players are on the field at once. Altair also guides Alice’s weapon so it impales Celestia, delivering a seemingly mortal wound. It’s up to Matsubara to throw caution to the wind and quickly “revise” her character by having Marine post a new illustration of her, full of power and resplendent in flames. The post catches fire itself, gaining thousands of likes and follows, thus imbuing Celestia with the power of that illustration, combined with his written words describing it. While it strains credulity for such a post to go viral so quickly, it’s neat to see the creator ability finally make a difference in a battle. I also like how Matsubara considers it a matter of pride as a professional creative that his protagonist not lose to the creation of an amateur doujin artist (though it’s a dig at someone whose full story we’ve yet to see, so I’m still reserving judgment on her). In the act of revising Celestia, Altair is somehow adversely affected, and seemingly shifts slightly out of sync with the world, the opposite of what she was going for. She beats a fast retreat, as the stars are “not yet in alignment” for her. It would seem she’s been foiled, but only temporarily. Worse, once she dissipates, Celestia reverts to her pre-revised state, complete with acute blood loss and gaping chest wound; she’s rushed to the hospital where hopefully she’ll be okay. And even worse still, We learn the end result Mirokuji’s battle with Chikujouin: she stole Hangaku from him, which surely drops him way down on the Creation Power Rankings. Still, everyone is still alive (for now) and the world still stands intact; that’s not nothing.